Ireland’s most valuable nursery sees Johnny Murtagh saddle four horses with Yolo Again dropping in grade following her best performance to date at Newmarket last weekend, when she finished sixth in the Group 3 Cornwallis Stakes. A dual winner who won a 5f nursery over the course last month, the daughter of Toronado will be tackling six furlongs for the first time, with 3lb claimer Shane B Kelly on board. The Murtagh quartet in this €50,000 handicap also includes Lord Rapscallion, who won a nursery over this trip at the Curragh in August and whose owners include ITV racing presenter Ed Chamberlin. Navan maiden winner Archaeology and So Familiar, winner of a nursery over a slightly longer trip at Cork this month, complete the trainer’s team for a race he last won as a rider on Beat Surrender nine years ago. Aidan O’Brien, who last won the event with Snow Queen in 2012, is represented by joint topweight North Wind, who lost his chance at the start at Navan on his most recent appearance having won a maiden over this course and distance in July. 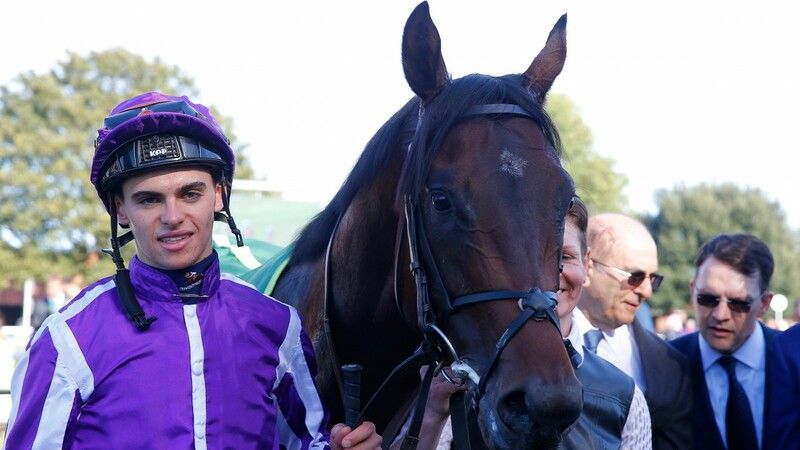 The son of No Nay Never is the mount of Donnacha O’Brien and is blinkered for the first time. The Darren Bunyan-trained Chestnut Express is the other course and distance winner in the line-up. She won a maiden at the track last month and is again ridden by Chris Hayes. Ger Lyons and Colin Keane, who combined to land the prize with Moonlight Bay a year ago, are responsible for Chicago May, the least experienced of the 16 runners. Dragons Call, who represents Johnny Feane, got a 13lb hike in the ratings for last month’s 5f nursery win from out of the handicap at Navan. Sean Davis claims 5lb off the daughter of Dragon Pulse. He seems in good form and should run a nice race. He can be a bit lazy and that’s why we’re using blinkers. I think he’s probably better than a handicapper and winning a race like this should be within his compass. However, the drying ground probably won’t be ideal. We gave her a break to freshen her up after her last run as she had a hard enough time of it and we’re hoping we have her ready to run a good race. She’s in good form and we’re hoping for the best, although I’d like to see some rain as she likes plenty of cut. I think she’s come forward since her nursery win at Navan. The ground was quick that day but we don’t think she’s ground dependent so easier conditions shouldn’t be a problem. He’s in very good form and is a course winner over five furlongs. Whether he really gets the extra furlong is the question. If he does then he should be in the mix. Is PETA offending Indian culture or humanising it?